SRINAGAR, Apr 17 2012 (IPS) - Recent research has found that over 90 percent of haemophilia patients across Kashmir are also affected by hepatitis due to the dearth of safe Anti- Haemophilic Factor (AHF) in the Valley. The long-term use of Fresh Frozen Plasma (FFP) as a substitute for AHF has put hundreds of haemophilia patients at high risk of contracting deadly infections, mainly hepatitis. A survey conducted by members of the Haemophilia Society of Kashmir in 2011 found that out of 137 haemophilia patients registered at Srinagar’s Shri Maharaja Hari Singh (SMHS) hospital, 115 were affected by hepatitis. Thirty-year-old Majid, a student of political science at the University of Kashmir, is himself affected by hepatitis. It cost him a month of treatment and over half a million rupees (about 9,700 dollars) to get himself cured outside the state. Haemophilia refers to a group of hereditary, genetic bleeding disorders that impair the body’s ability to control blood clotting or coagulation when a vessel is ruptured. Haemophiliacs are prone to excessive external bleeding as a result of even small wounds or cuts, as well as heavy internal bleeding. The AHF injection surgically inserts the protein substance in blood plasma that is essential for the blood-clotting process, and is regarded as the safest mode of treatment. FFP, on the other hand, is a frozen and preserved form of human blood also used to treat haemophilia, which experts say poses risks of infecting patients. Javaid Rasool, a haematologist at Sher-e-Kashmir Institute of Medical Sciences (SKIMS), said FFP involves the highest risk of transmitted hepatitis of all categories. The state of Jammu and Kashmir has 223 registered haemophiliacs, most of them children. According to World Health Organisation (WHO) standards, the most common form of the disorder, haemophilia A, occurs in about one in every 5,000–10,000 male births. Haemophilia B, on the other hand, is much more rare, occurring once in every 20,000–34,000 male births. Within the WHO parameters, the Valley is home to roughly 1200 males suffering from this disorder. Until 2011, FFP was widely used by haemophiliacs in Kashmir, as a substitute for AHF, which was not available at government hospitals or pharmacies. 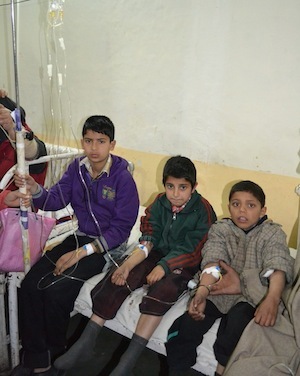 After the state High Court directed the government to ensure safe AHF to patients, treatment was readily available for six months – but only at the SMHS hospital, not at any other hospital in Srinagar or even at the district level. Over the last month, haemophilia patients have stopped using even the small quantities of AHF available at the city hospital, alleging that the injections, procured through a new process, are unpurified and thus unsafe. Most patients are now back using FFP. “AHF has to be purified. Initially the one that was being used here was of the best quality and purified. But now the hospital authorities have (linked up) with a company that does not sell purified AHF,” said Majid, adding that the unsafe injection poses the danger of all kinds of lethal infections. Manzoor Ahmad, father of an 11-year-old haemophilia patient, is forced to order AHF for his son from New Delhi. “For a few months, we had safe AHF available free of cost. But now, what is being sold is unpurified, which has high risks for patients,” said Manzoor. Manzoor says even approaching the authorities about the issue yielded no results. “No one is ready to listen to us. The government is being insensitive to our grave (suffering),” he lamented. Forty-three year-old Altaf Hussain Shah was infected by hepatitis after using FFP for years. He was diagnosed with hepatitis C in 2005 but no amount of treatment has brought any improvement. Shah is an employee at the records department of SKIMS, the Valley’s leading medical institute, which only runs a consultation clinic for haemophiliacs. “We have no facilities (and so) patients are forced to use FFP, as the AHF sold by the government is not safe,” he stressed. Haemophiliacs have even staged protests against the non-availability of safe AHF but still the government has failed to take action. Senior haematologist at SKIMS, Samoon Jeelani, told IPS that a good number of people continue using FFP, despite awareness that it is a risky treatment. He said more efforts should be made to improve health care for haemophilia patients. An official at the SMHS hospital, however, declined to comment on the issue. “I cannot talk on the issue. You will have to seek permission from higher officials, only then can I say something,” Ruby Reshi, associate professor and head of the department of pathology at the Government Medical College, told IPS.